National Volunteer Week – Day 3. 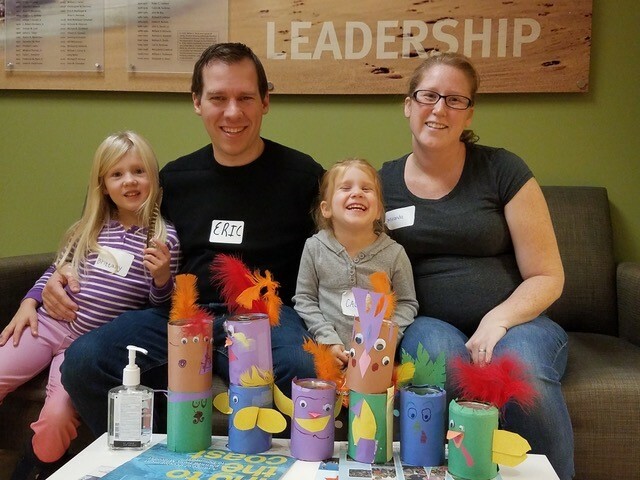 Family Volunteer Day Spotlight! 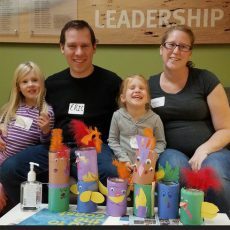 Last November, a group of nearly 50 volunteers came out for Family Volunteer Day to create centerpieces for Wayside Food Program ’s annual Thanksgiving meal and assembled 400 parent engagement kits for families through Starting Strong’s Connections in the Community. Their efforts ensured a welcoming atmosphere for guests of Wayside’s Thanksgiving meal, and provided parents with little ones a fun and easy way to improve their babies’ learning with engaging materials, tips and songs. Volunteering as a family helps strengthen familial bonds, teaches children the importance of giving back and helping others, and helps to ensure that larger scale projects get the human power needed to succeed. Eric and his wife Miranda, members of Brick & Beam Society, and their children Brittany and Callie were able to participate in an accessible and fun way for the whole family. Brick & Beam Society is an individual giving group of the United Way comprised of a community of emerging and established professionals committed to increasing STEM and literacy enrichment opportunities for under-served children in Greater Portland. Members invest their time, skills, and finances through United Way of Greater Portland to support programs that align with Thrive2027 and give the kids in our community a better chance to succeed as adults. To learn more about volunteering as a family or group visit volunteer.unitedwaygp.org. To learn more about Brick & Beam Society visit brickandbeam.org.